Travel blogging can be an exciting hobby, but for some, it could also be an inspiring alternative to a 9-5 office job. Whether you want to make a full-time career out of being a travel blogger or you simply want to document your travels for your own personal pleasure, we’ve put together a handy guide to starting your own travel blog. 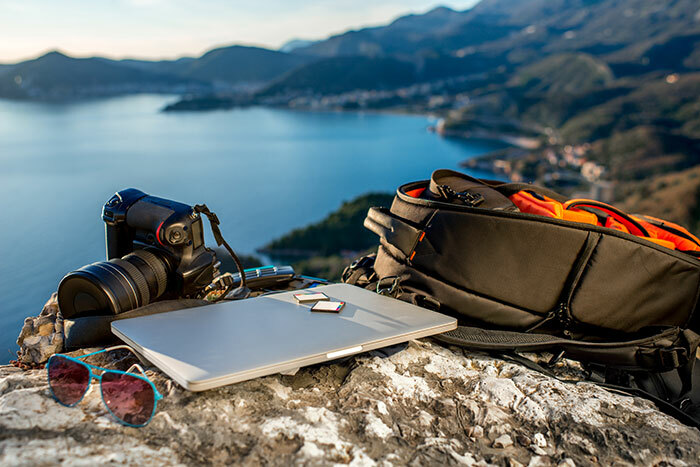 Professional travel bloggers have an extensive blogging toolkit that allows them to capture inspiring, high-quality images and create content, including state-of-the-art laptops, phones, and cameras, not to mention expensive editing software. The price of this kit can break into the thousands, but when you are starting out, you don’t have to shell out a large amount of money and you can keep your outgoings relatively low. The bare minimum you will need is a device to take photos and to create and upload content as well as social media channels so you can share your posts. If you have a laptop or a phone, you are good to go. While setting up a travel blog needn’t cost a fortune, you will have to invest a lot of time and energy into it, particularly in the beginning stages. You will need to set up hosting for your blog and install a platform like WordPress, learn how to navigate the dashboard and of course create content for your blog. Choose the cheapest hosting plan and then you have very little to lose should your travel blogging plan not work out the way you want it to. Once you have downloaded WordPress, you will need to choose a theme – this will determine the colours you want to use for the design and the layout of the images and content. You can use free design programmes such as Canva to design a custom header image for your site. Whether it's WordPress or another platform, you should spend a day or two familiarising yourself with the dashboard and downloading plugins to customise your blog. Once you are happy with the appearance of your travel blog, it is time to publish that all important first post. Begin by brainstorming travel-related topics that you are passionate about. Yes, experienced travel bloggers may travel for free, but until you reach that level, you can create content from your passions and past experiences. You do not have to spend hundreds on a dream trip to create content that is engaging. You will also need to think about imagery at this stage. How will you enhance your content with beautiful photography? If you don’t have any photos that are suitable, there are a number of platforms such as Unsplash that offer royalty free images. Alternatively, get out there and start snapping images on your phone, you don’t need a pricey camera to capture a good photo. Publishing your first blog post is the official moment that you become a travel blogger. However, how are you going to attract readers and gain exposure? Building an audience takes time and there are a number of strategies that you can do to gain the right following. Use search engine optimised content to get your site ranked by Google. Optimising your posts using keywords and meta data can help your blog post to show up on the first few pages on Google – particularly if you're writing about a niche subject – which in turn helps to attract visitors. Social media also plays a huge role in building an audience. Sharing your posts on Twitter, Facebook and Instagram offers increased exposure as well as the chance to network with other bloggers. If you plan to run your blog like a business, you may be wondering how you can begin to make money from your travel blog. You can monetise your blog by collaborating with brands on sponsored posts, offering advertising packages and using affiliate links. Of course, you need to build an audience first, but if your blog features high-quality content and inspiring images, as well as a good level of reader engagement, the opportunities to monetise your blog will soon roll in. Interested in writing for the Flight Centre UK travel blog? Email content@flightcentre.co.uk to find out more.